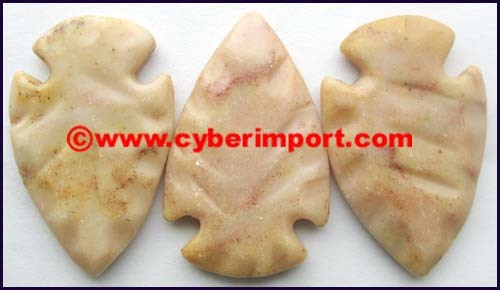 OUR ONLINE CATALOG and this indian arrowhead collectibles page serve as a cross-section of our China exports. Greater variety is available. Email us a photo example of what you seek. Export prices often change. All are re confirmed after your inquiry. You will be emailed a pro-forma invoice offer. 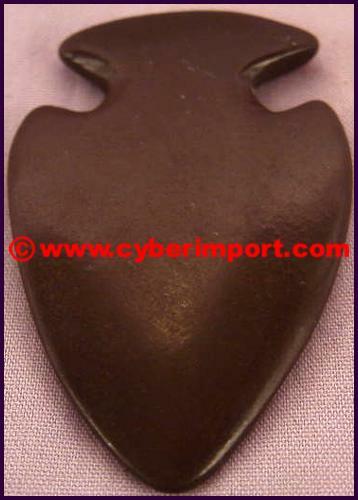 This hand-carved arrowhead is made from dark brown stone. It has a smooth finish almost like a riverstone. 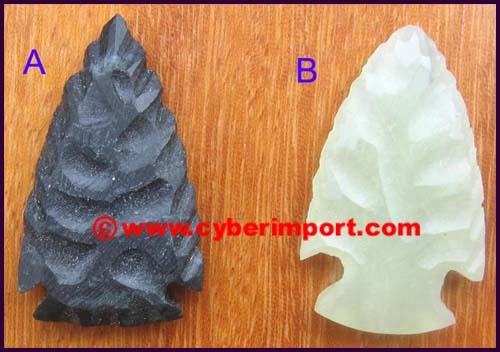 cvst001 $0.32 1000 12 1 15/16"x1 1/4"x3/16"
This hand-carved arrowhead is made from genuine banana jade. It has a smooth finish almost like a riverstone. 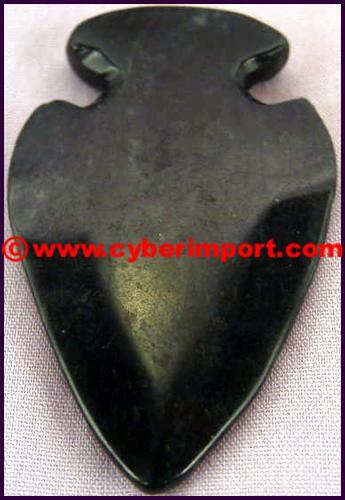 cvst002 $0.32 1000 12 1 15/16"x1 1/4"x3/16"
This hand-carved arrowhead is made from black jade. It has a smooth finish almost like a riverstone. 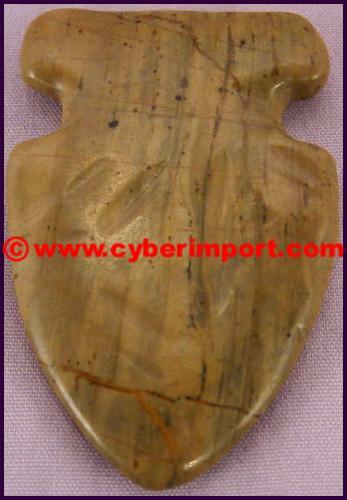 cvst003 $0.32 1000 12 1 15/16"x1 1/4"x3/16"
This hand-carved arrowhead is made from brown stone. It has a smooth finish almost like a riverstone. 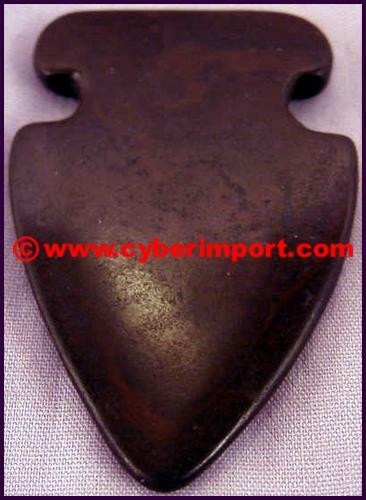 cvst004-1 $0.32 1000 12 1 15/16"x1 1/4"x3/16"
This hand-carved arrowhead is made from brown stone. It has been given an "irregular" finish to simulate American Indian chipped style, but is still smooth. 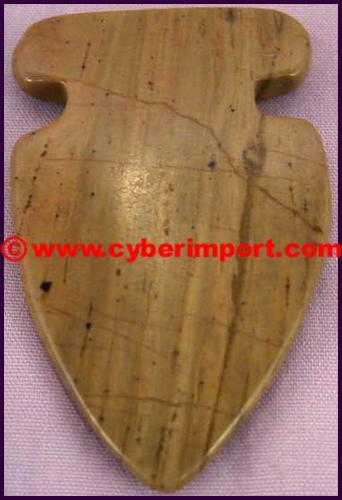 cvst004-2 $0.32 1000 12 1 15/16"x1 1/4"x3/16"
This hand-carved arrowhead is made from tan color stone. It has a smooth finish almost like a riverstone. 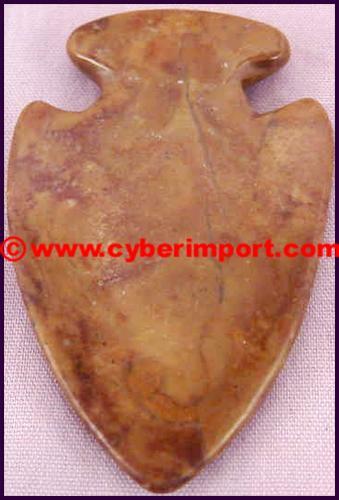 cvst005-1 $0.32 1000 12 1 15/16"x1 1/4"x3/16"
This hand-carved arrowhead is made from tan color stone. It has been given an "irregular" finish to simulate American Indian chipped style, but is still smooth. 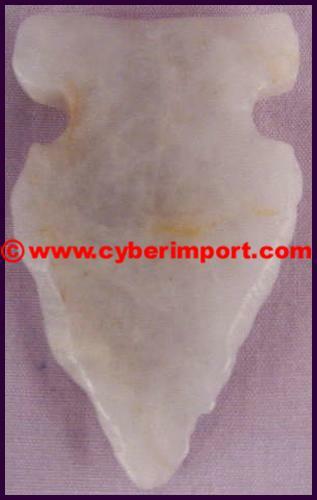 cvst005-2 $0.32 1000 12 1 15/16"x1 1/4"x3/16"
This hand-carved arrowhead is made from banana jade stone. It has a smooth finish almost like a riverstone. 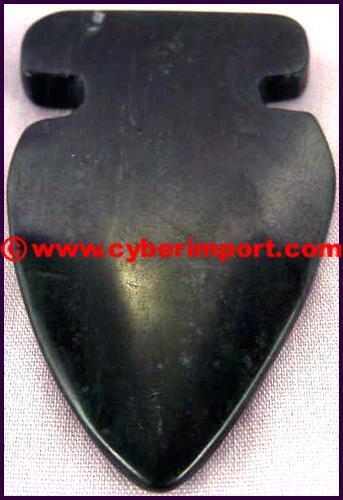 cvst006 $0.32 1000 12 1 15/16"x1 1/4"x3/16"
This hand-carved arrowhead is made from black jade stone. It has a smooth finish almost like a riverstone. 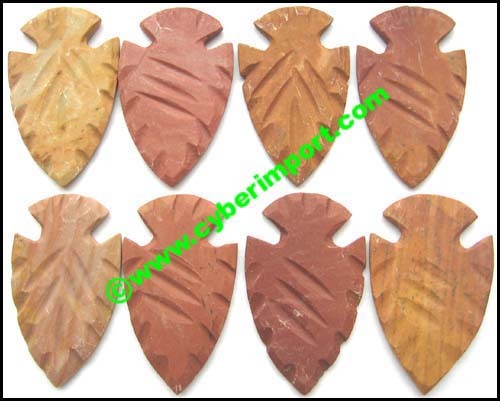 cvst007 $0.32 1000 12 1 15/16"x1 1/4"x3/16"
cvst008 $0.32 1000 12 1 15/16"x1 1/4"x3/16"
This hand-carved arrowhead is made from a gray, semi-translucent stone. Chinese call it "turtle stone" because it is even harder than jade. This piece simulates a more "chiseled" look in its rougher appearance. This technique can be used on any of our stone arrowheads. 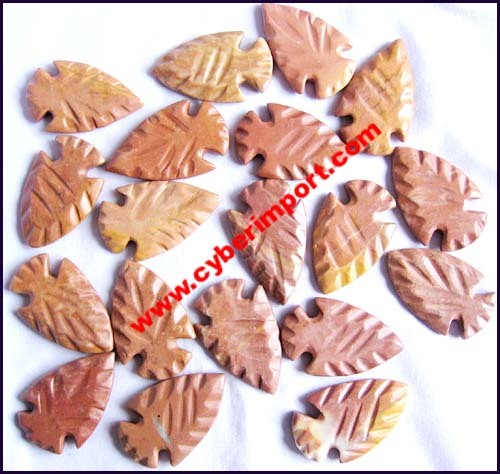 cvst009 $0.32 1000 12 1 15/16"x1 1/4"x3/16"
cvst010 $0.32 1000 18 1 15/16"x1 1/4"x3/16"
China Factory Minimum Quantity of these indian arrowhead collectibles items can be negotiated with factories. Dollar Amount is often more important to smaller factories than the quantity of each piece. 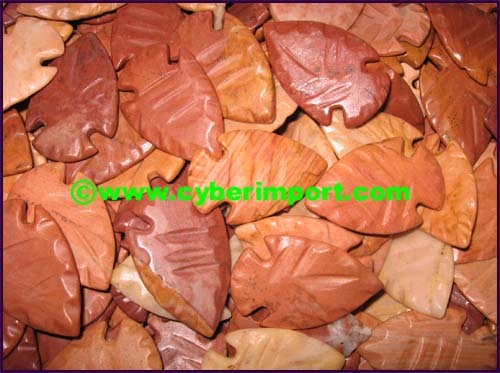 Minimum quantity often can be divided among several indian arrowhead collectibles or stock numbers. Please inquire with us about your specific needs for smaller quantities than those listed. Smaller quantity can result in a bit higher price. Ask us for a quote. 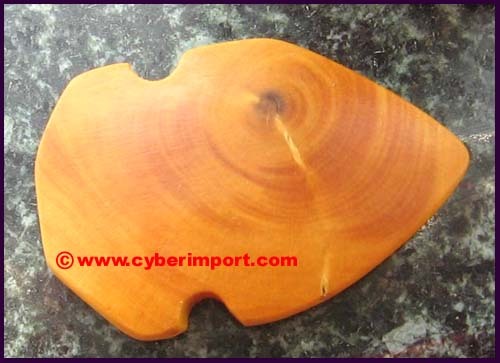 Custom Orders are possible with any of our indian arrowhead collectibles products. Send us a .jpg example of what you want. If we don't have it, we can get it.